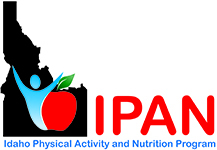 The Idaho Physical Activity and Nutrition Program (IPAN) partnered with the local public health districts, the Idaho Association for the Education of Young Children (IAEYC) and the IdahoSTARS Quality Rating and Improvement System (QRIS) to develop the training for child care professionals. They created a workshop curriculum around five goal areas: healthy eating, healthy beverages, physical activity, screen time and infant feeding. As a result of this work, six Let’s Move! Child Care (LMCC) workshops have conducted trainings for over 120 child care staff who care for an estimated 2500 children daily. Each of their facilities registered with the national LMCC, filled out a checklist that rates how well they are doing on the five goals listed above and developed an action plan to move them ahead on steps to achieve these goals. Additionally, through the IPAN and IdahoSTARS QRIS partnership there is now a LMCC workshop facilitator available in every region of the state, which improves access to training for ECE providers across the state. Kati Wagner, President of the Wildwood Child and Adult Care Food Program (CACFP) in Centennial, Colorado, got Colorado CACFP providers signed up and participating in LMCC with huge success.